His Eminence Metropolitan Elpidophoros (Lambriniadis) of Bursa was born in Istanbul (1967). He studied at the Aristotle University of Thessaloniki (1991), completing postgraduate studies at the University of Bonn (1993). He attended the Theological School of Balamand (1996-1997) and submitted his doctoral dissertation at the University of Thessaloniki (2001). 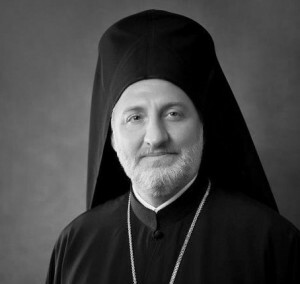 In 2005, he was elevated to Chief Secretary of the Holy and Sacred Synod and ordained to the priesthood. In 2009, he was unanimously elected Assistant Professor of Symbolics, Inter-Orthodox Relations and the Ecumenical Movement at the Theological School of Thessaloniki. In 2011, he was elected Metropolitan and appointed Abbot of the Holy Trinity Patriarchal and Stavropegial Monastery on the island of Halki. He participated in the theological dialogue between the Orthodox Church and the Lutheran World Federation and Patriarchal delegations to the Conference of European Churches and the World Council of Churches, where he serves on the Faith and Order Commission.